I've been buzzing around my studio finishing up some custom orders. I love how custom orders stretch my brain. Other people have ideas about fabrics that I mentally tagged for something else and, voilà, there is something new and unexpected! Here are some nifty ideas from the brains of others. First, a fused shopping tote for my friend, Steph. 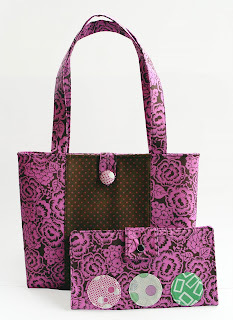 This bag was inspired by the "One Small Change" series on Steph's blog. 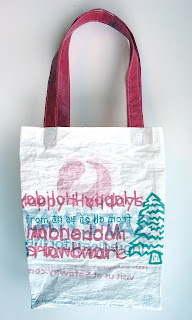 I used the Fusing Plastic Bags Tutorial from the Etsy Labs Blog. I was so excited to find bags with trees for the exterior! Next is a Handbag/Passport Wallet in Spumoni that I sent off yesterday. It's so fun to see fabrics that I envisioned in a smaller medium get to spread out and be grand. Do you have any nifty ideas from the brains of others? Just received my bag yesterday and it is PERFECT! I love it! Thanks so much. Would have taken a photo of me using it today, but we are staying at home to work on potty training. Fun, fun, fun. I'm so glad you like it! My sister just requested one made from Ikea bags. Ooooh, good luck with the potty training. Such a pain but the ultimate outcome is AWESOME!!! I love your newest creations! I agree - my customers have sometimes challenged me to step outside of my comfort zone, and even though at times I've been timid - I've ALWAYS been so glad that I did! * I always keep notes in my sketchbook detailing custom orders and what steps I took to make the final product. So if I ever need to re-create those items I won't have to redesign them all over again! Thanks, Jenn! I imagine your sketch book full of pretty and adorable pictures an designs. I've been thinking about getting a sketch book. My sketches tend to be on notebook paper or whatever construction paper my kids have left lying around.